Your bathroom is one of the most important rooms in your home, so when installing a new suite you’ll want company you can rely on with an excellent track record and solid reputation. At Maintrade we are proud to call ourselves bathroom experts who have the experience and know-how to create the look and feel you have been longing for. Our dedicated team of specialists will take care of all your new bathroom installation needs while ensuring all work is carried out on time, on budget and with minimum disruption. We can take your tired and run-down bathroom and turn it into the stunning focal point that your home deserves. And because we are plumbing, tiling and plastering experts, we can oversee the whole project from start to finish without the need to employ extra tradesmen or subcontractors. Contact us today for a free quote. We’ll give you a fixed price for a full installation, meaning you can relax in the knowledge that what we say is what you’ll pay, with no hidden extras or hourly charges. 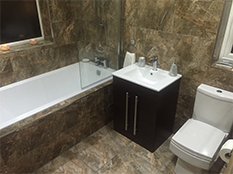 If you have a new bathroom project, or a bathroom and wet room installation requirement, please contact us today. Alternatively, fill in the form on the left side of this page and we will call you straight back.